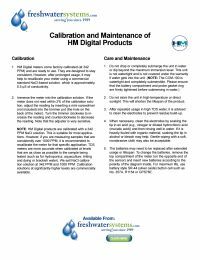 With the push of a button the HM Digital QC-1 displays a green or red light, indicating good water quality, or service required, respectively. Tests for TDS or conductivity levels. Eight programmable set points (by dip switch). Factory calibrated to 100 ppm NaCl. Recalibration is unecessary.